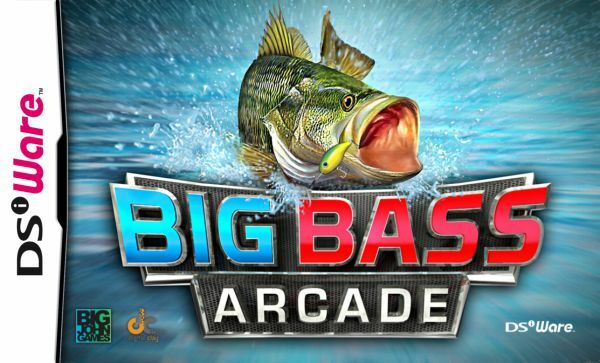 Big Bass Arcade seems to be as good an adaptation as DSiWare can reasonably offer the sport. 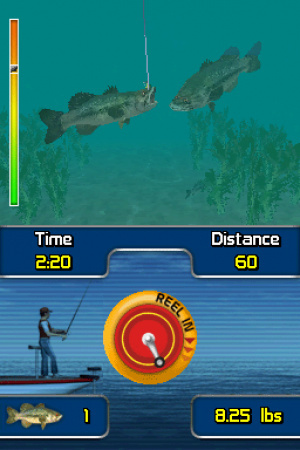 We say that not in a back-handed way, but knowing that whatever potentially horrible type of fishing game could have been released on DSiWare, Big Bass Arcade manages to break on through and be kind of fun anyway. True to its name, Big Bass is as action-packed as fishing gets — there is virtually no waiting for a bite, and those of us who can only hope to catch the underside of the boat in real life can experience in a rapid-fire way the sensation of tricking a poor aquatic creature into eating a metal hook. You pick a location, line up your cast to where you can see bass swimming about, and within five seconds of hitting the water you'll know whether your lure is worth baiting as fishies bite or shrug their fish shoulders indifferently. Once they come a'nibblin' is when the action starts. 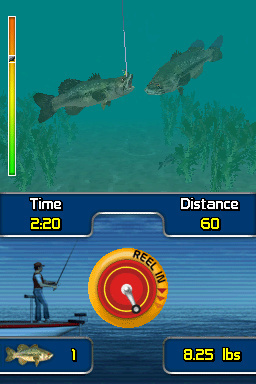 Using either the stylus or face buttons, you have to try to reel in the bass without breaking your line. The face buttons allow for slow and fast reeling, but the touchscreen is where it's really at: spinning the stylus around the reel on the bottom screen not only feels more intuitive but is just plain more fun. 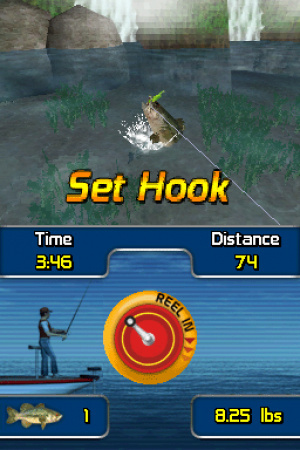 As you reel, the announcer will yell out directions for you to yank the rod in order to overpower the catch, and moving the stylus in each direction all while spinning lends a sense of struggle that simply pressing Up or Down on the D-Pad doesn't provide. Reeling in a fish takes anywhere from 10 to 30 seconds, so there's never a dull moment. There are a handful of slightly different timed scenarios and tournaments, but for the most part it's all the same gameplay. More variety would have been welcome, though, as it can all get old quick if you're not otherwise invested in the sport. And with every single fish in game a bass, the inclusion of another species would have gone a long way in fleshing out the experience. The assortment of lures help in this regard, but you'll eventually find a one-size solution and never really need to bother with the others. High scores are tracked for each mode as well to give truth to your tales and keep score junkies going. 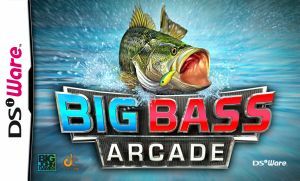 Big Bass Arcade doesn't have much in the way of variety, although its one gameplay hook is surprisingly satisfying while it lasts. Fishing enthusiasts will likely get the most longevity out of it, but anyone open to its quick-fire nature might find the game to be a pleasant little diversion. This actually doesn't sound so bad. I daresay I'd even buy it if I had a DSi. I downloaded it and i must say it is pretty fun, and fishing works perfectly. My only real complaint is the "showing fish" animation; the fish looks stiff as a board. Also, the music button before starting a game is buggy. I just bought and downloaded it today after finding it on DS shop last week and I am happy. For the most part my opinion isn't too great of the shop games but this is one of the good ones. I recommend it, especially for a 500 point game. Agree, great game for 500 points! Love the variety with the different lakes and it is very realistic. Like the tournament mode a lot.